One of the hardest things you have to master, while living in New York, is how to pack for the entire day. If you're like me, and public transportation is your only means of transportation, you have to learn how to bring everything you'll need for the day with you, especially when you live far away and have plans after work . There is nothing worse than leaving your favorite pair of comfy flats at home and having to walk around in heels when heels are no longer the required dress code. Now you can definitely try your luck and run home but, the way the subways are set up, by time you go all the way back home to change, the event you were planning to attend will be at capacity or over. So, I thought it would be a helpful to show how you can transition your look from office to after 5 with a few simple outfit touches. I decided to pair this cute long sleeved bodysuit with one of my favorite pair of track pants. 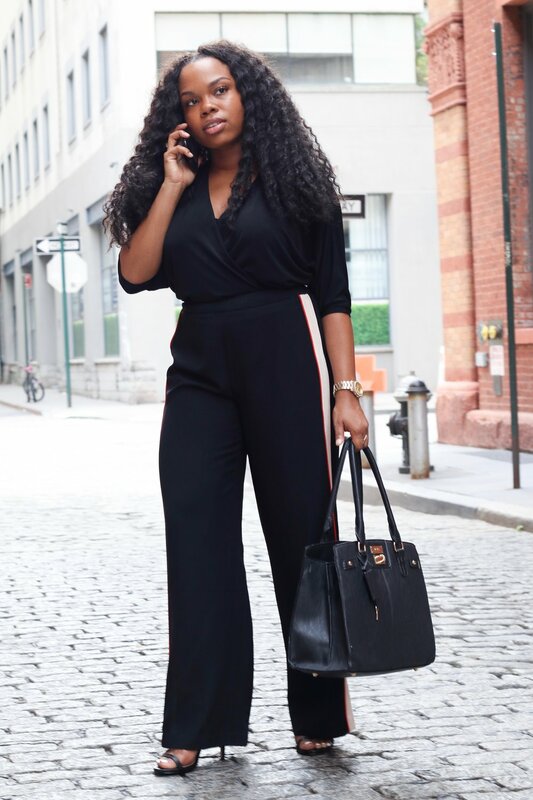 The simple stripe detail adds flair to the look but it's still professional and very appropriate for the work place. If you pay attention to people who live in New York, everyone carries at least one form of shoulder bag. While it may compliment their look or go completely against it, the main purpose for this bag is to house their "entire day" needs. Tip #1 : Get you a bag that can actually hold stuff! This switch up was super simple and took less than 5 minutes. There will definitely be times when you have to rush over to an event after leaving work and you only have time to walk to the train. Therefore, you have to find ways to transition your look in a matter of seconds without adding all the extras. For this look, I pulled down the bodysuit and made it off the shoulder to give off a little skin. Then I added a statement accessory necklace to bring some attention to my neckline. Tip #2: When you have larger breast bringing attention to your neck/shoulders by adding jewelry or wearing off the shoulder tops will help to take away the attention on your girls. Lastly, I switched up the purse to house only my essential needs for the event, so I'm not digging through my big bag trying to find something. The initial look can be worn to work, of course. The after 5 transition can be worn to any events after 5.